It’s Official. Mississippi’s Sarah Thomas Is the First Female NFL Ref. - Mississippi Believe It! Home » Resources » Campaign » It’s Official. 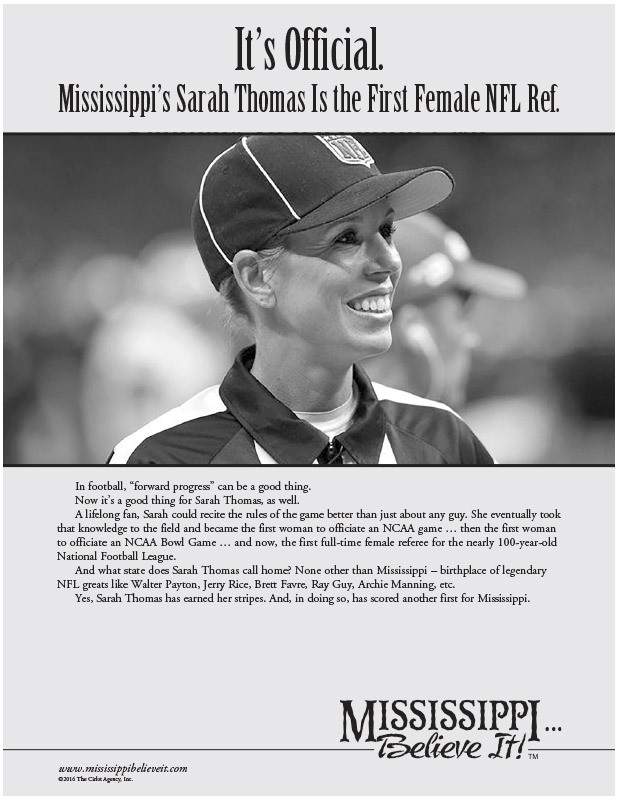 Mississippi’s Sarah Thomas Is the First Female NFL Ref. It’s Official. Mississippi’s Sarah Thomas Is the First Female NFL Ref. In football, “forward progress” can be a good thing. Now it’s a good thing for Sarah Thomas, as well. A lifelong fan, Sarah could recite the rules of the game better than just about any guy. She eventually took that knowledge to the field and became the first woman to officiate an NCAA game … then the first woman to officiate an NCAA Bowl Game … and now, the first full-time female referee for the nearly 100-year-old National Football League. And what state does Sarah Thomas call home? None other than Mississippi – birthplace of legendary NFL greats like Walter Payton, Jerry Rice, Brett Favre, Ray Guy, Archie Manning, etc. Yes, Sarah Thomas has earned her stripes. And, in doing so, has scored another first for Mississippi.